Hey there! Since 2018 has been a year full of travel, I thought I would go ahead and start writing about my journeys from now on! I should have started this sooner, but school and life overall have kept me busy. Over the year I have traveled to California, Houston, Boston, and South Carolina. I traveled to both California and Houston to visit my boyfriend when he was away on his internships for school. I only spent a few days in each place and saw plenty of new things. However, since I traveled to Boston for more than a few days, I thought I would start on this trip and go into depth on what we did and saw. I absolutely loved Boston and would love to share the details of the city that I fell in love with. Whether you’re here to see where to travel in Boston or see where else I go, come along with me! We bought our tickets through Southwest from Chicago to Boston for our fall break during school. Surya’s sister lives and works in Boston and we thought it would be a good time to travel to a new place and see Arthi for a few days. We had bought the tickets for their lowest price, being the latest in the day. Our flight from Chicago was supposed to depart at 10:40 PM, but due to weather, didn’t depart until around midnight. We didn’t arrive in Boston until 3am and by then we were completely exhausted and ready for bed. Next time we will definitely be paying more for an earlier flight. Once we had landed in Boston, we Ubered to Arthi’s house and crashed for the night. We didn’t get up and ready until 11am the next morning because we were so tired. We were only in Boston for three days and wanted to make the most out of it. We were able to make it out the door before noon and go on a hunt for some donuts (Fun fact: every city were in, we try to find the best donut shop). I had done some research about Boston beforehand and heard that Union Station Donuts was the place to go. It just so happen to be right down the street from Arthi’s apartment (which by the way is the cutest little apartment I have ever seen and hope that my apartment will look as cool as hers someday). We met up with our good friend John from Harvard at the donut shop and caught up on school and life. I tried the apple cider donut as it was the only cake option available. To me, it tasted like an elephant ear and not like a donut. I definitely would have loved to have seen more cake donut options. And since it was an absolutely beautiful and chilly day outside, we decided to walk to the closest farmer’s market. It was adorable and I love the idea of having one everyday for the entire year. Once we finished our donuts, we headed over to Draper for their family and friends event where we spent time seeing the newest innovations. We were able to try truffle oil tater tots from a food truck and raspberry lemonade. I highly recommend these as I couldn’t get enough of them. They were a great snack for a busy day. Then we walked down the street to MIT to tour the campus and see the Charles River. We then started walking towards Harvard and stopped at the French Baguette for food and a quick break. They have breathtaking cakes and I would to have tried one if I wasn’t so full. Definitely an Instagram worthy stop. John took us to Harvard and wow I’m just going to say that it by far the best campus that I have ever been on. I love the historic buildings and the numerous different shops they have available. I was able to get my Harvard shirt and tour the library. Of course we were hungry again and decided on one of the taco shops. I love tacos and this place was upbeat and busy. Looking small on the outside, the restaurant went up two floors and had a unique ordering line. I got pork tacos and we all shared chips and salsa. I loved every part of it and would love to go back and recommend. I wish Purdue had such unique spots like these. Once we had dinner, Surya and I were exhausted from getting in the day before so we decided to go back early and have a game night. Even on our first day in Boston, I knew I was going to going to fall in love with this city. The next day, we woke up and got out the door around 11am again. We took the train back into the city and started at another donut shop. I love how quick and convenient the trains were. They were relatively cheap and didn’t take longer than 15 minutes to get anywhere. I had wanted to try Blackbird Donuts forever because I had seen them on Pinterest and online. I must say that these are some of the best donuts I have ever had. We got double chocolate, mocha, and their original. I wasn’t a fan of the mocha flavored one because I’m not a fan of coffee, but their double chocolate was amazing. It ranks right next to one of my favorite donut shops in Chicago. The donut shop was right next to Fenway so we took some time to walk around and see other parts of the city. It was in the high 80s that day and I definitely didn’t pack accordingly. We walked through the city gardens and through some of the smaller neighborhoods. To me, it’s mind blowing how such old buildings can be standing right next to skyscrapers. It got too hot to where we wanted to go inside so we stopped at Mapparium, known for their stain glass world map. It was a really cool experience to walk into the globe and see the historic map of the world back during the world war. Unfortunately, we couldn’t take pictures, but I highly recommend taking the time to see it. 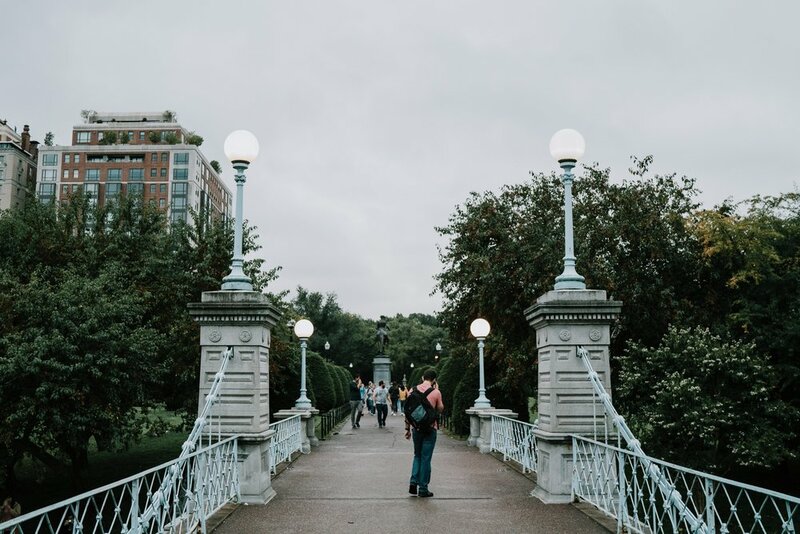 By the time we had made our way through the museum, it was getting darker out and we decided to walk through the Boston Commons. I thought it was beautiful with all the fall leaves and dark gloomy weather. If I’m going to live here, I’ll bring every couple I photograph to this park because of the different locations and stunning views of the city. Arthi had planned for us to meet John and a few other of their friends for dinner for Dim Sum in Chinatown. We had a bit of time to spare so we stopped at the local coffee shop and sat down for the first time all day. Then Arthi told us about Primark, similar to H&M and something we definitely don’t have here in the Midwest. We totally should though. Once our feet didn’t hurt so much, we walked over to Chinatown and found John. Turns out, the restaurant was also having a wedding the same time we were there. We thought the couple had rented the entire place out, but once inside, the staff scurried us through the reception to the back room where all the Chinese dance performers were hiding. It was as if we were part of the wedding. We got to see the first dances and lion dance performances. This was also the first time Surya and I had tried Dim Sum. I don’t remember all the types we ordered but I loved almost every single one of them. I think I ate around five and was fully stuffed by the end. All of us rolled out of the restaurant and took the train back to Arthi’s. We had another game night, and then passed out again for the evening. On our third and final day in Boston (I was very sad that we would be getting on a plane to go home that night), we spent much of our time near the North end of Boston. Bright eyed and bushy tailed, we made it out the door by 9am. We took the train back into the city and met everyone at Tatte Bakery (one of the more famous Insta and Pinterest places of Boston). And oh my god, Tatte Bakery is so delicious and cute in a small little shop. While it was very Instagram worthy, I was so hungry that I didn’t get any pics on my camera. It took me forever to decide on what to eat, but I finally chose the Heirloom Tomato Flatbread. For the size, it was priced pretty well and was extremely flavorful. Then I couldn’t contain myself and had to try the cheesecake (what they are known for). BEST CHEESECAKE EVER! If you are ever in Boston, this cheesecake is fluffy and not too heavy. The raspberries on top were fresh and I could’ve eaten the entire cheesecake and not just the mini version. 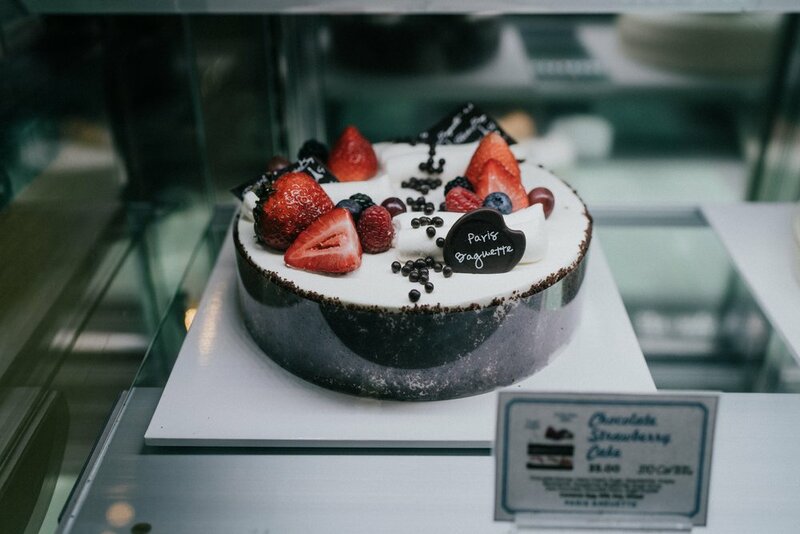 If I move to Boston, I will be buying this cheesecake for every meal. Once we stuffed ourselves again (all we did on this trip was eat), we made our way to Beacon Hill and Little Italy. Even though I had just eaten cheesecake and flatbread, we bought cannolis at Mike’s Pastry. I got the chocolate chip kind and Surya got the ricotta. It was so good that we ate it all before we got to our next stop, this time we were really stuffed. It had been raining all day and Boston looked like it had been in my head the whole time before arriving there. We walked on over to Seaport and saw where the Boston Tea Party was. Drizzling and cold we hopped into an Uber and headed back to the apartment. It was time to say goodbye to the city I had fallen in love with. We packed our bags and waited for our plane. It had gotten foggy so we ended up at the apartment for a little while longer before we went to the airport. I highly recommend visiting Boston as I would move there now if I could. There are so many different places to see and eat and I am truly amazed by all the delicious food choices and gyms to make up for it. See you soon Boston.